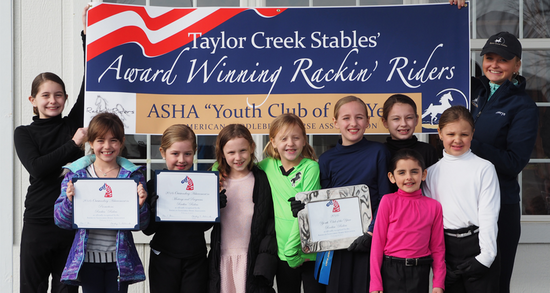 Taylor Creek Stables is home to the ASHA Youth Club, The Rackin' Riders Youth Group. This Club is open to all Taylor Creek riders, ages 17 and under. The Rackin' Riders Youth Group meets once a month and participates in fun and educational horse (and non-horse related) activities such as: fundraising for ASHAM and Saddlebred Rescue, crafts, field trips and movies, games, horse sense, breed knowledge, and much more! New members are welcome to join at any time during the year! Come join the Rackin' Rider Fun!